This week Jewel Osco weekly ad circulars, coupons and sale specials. 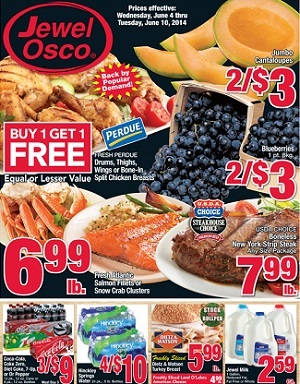 Every Jewel Osco store ad features savings & promotions on grocery products, pet supplies, home goods and more. Find the latest ad specials on: Jumbo Cantaloupes; Hinckley Springs Water; Butternut White or 100% Whole Grain Wheat Bread; Fresh Perdue Drums, Thighs, Wings or Bone-In Split Chicken Breasts; Quaker Captain Crunch or Life Cereal; Friendly’s Ice Cream; Oscar Mayer Meat Bologna or Cotto Salami; Claussen Pickles; Oscar Mayer Fully Cooked Bacon; Reser’s Potato, Macaroni Salad or Cole Slaw; Hillshire Farm Smoked Sausage; Margaritaville Premium Breaded Shrimp; Glenmark Great Grillsby Burgers; Papa Charlie’s Italian Beef and Gravy; Supreme Choice Premium Seafood; Fresh Hormel Marinated Pork Roasts; USDA CHOICE Boneless Ribeye Steak; Assorted Bone In Pork Chops; Van Camp’s Baked Beans; Indian Summer Apple Juice; Kauai Coffee; Home Run Inn Ultra Thin Pizza; Frigo Mozzarella Cheese; Brownberry Whole Grain Bread; Smucker’s Jam or Jelly; Jif Peanut Butter; Hunt’s Ketchup or Gulden’s Mustard; Tide Laundry Detergent; Febreze Fabric Refreshers; Oral-B 3D Whitening Duo Toothbrush; Old Spice Body Wash; Dietz & Watson Sour Garlic or Kosher Dill Pickles; Revlon Lip or Nail Cosmetics; L’Oréal Preference Hair Color; Iams Dry Dog Food; and more. Jewel Osco stores activate their latest weekly ad every Wednesday. Jewel-Osco is a supermarket chain headquartered in Itasca, Illinois, with 183 stores across northern, central, and western Illinois; eastern Iowa; and portions of northwest Indiana. The grocery stores offer a convenient shopping experience that includes everything from meat, breads, dairy, pasta, fresh produce and more.